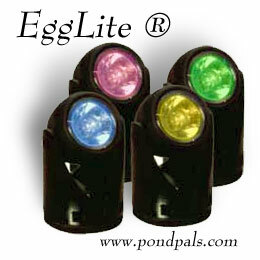 The patented EggLite lighting system adds nighttime beauty to ponds, fountains, statuary, potted plants and landscaping. The 10-watt all purpose EggLite is a compact spot light that can be used wet or dry and is suitable for fresh, salt or chlorinated water, making it extremely versatile. Submerged, with their bases attached, they serve as dramatic underwater lighting. Magnetic base with stainless steel screw and nut. The Power Control Center allows backyard water gardeners the flexibility of installing a pond where no electricity is near the pond site. Now you can control the operation of your pumps, U.V. 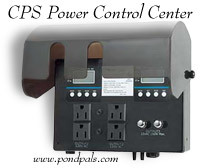 clarifiers, underwater lights, and other necessary items with the Power Control Center. 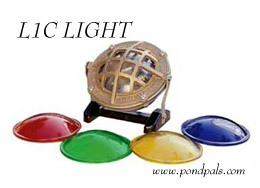 The ultimate luxury to power your pond.